Want to know more about my families? George Ellis is my great great grandfather. I am given to understand George Ellis was born in Heathfield, Sussex, England, on 17 September 1821, the son of George Ellis (1788-1873) and Elizabeth Knight (1793-aft 1871). I am now not convinced as to this date of birth as in Florence Smith (nee Ellis), his grand daughter's birthday book, his birthday is given as 11 June 1820. If this is the correct George, he was christened on 28 October 1821 in the Independent Non-Conformist Church in Heathfield, near Horsham, Sussex. However my recent research suggests this may not be the case as this family has a George who appears in the 1841 census and as our George can't be in two places at opposite sides of the world at the same time! George did however emigrate on 27 October 1839 from London, England via the Downs, aboard the "Rajasthan", a 3-masted ship of 700 tons, captained by Captain Duncan Ritchie, arriving at Port Adelaide, South Australia, on 6 February 1840. Unfortunately, as far as I am aware, there is not a complete passenger listing available for this arrival of the "Rajasthan". The ship then went on to Port Phillip and Bombay. The "Rajasthan" was accompanied by the "Java" and a diary by James Trangmar, a passenger on the infamous "Java" voyage, provides some insight as to the likely conditions George might have experienced on his voyage. The Richards family diary from the "Java" also mentions the "Rajasthan" racing to Port Adelaide. The Adelaide Register of 8 February 1840 notes the arrival of the Rajasthan in the Weekly Report of Vessels in the Harbour, with a description of her cargo. There is also mention in the same paper of a dinner attended by a number of the most respectable passengers newly arrived on the Rajasthan and those who had arrived on her earlier voyage which George would most likely have attended. On 7 June 1847 George aged 26, labourer and a bachelor, married Sophia Ransom Maidment, aged 18 a spinster in the Macclesfield Chapel, Macclesfield, South Australia. The officiating clergy was Rev. John Baptist Austin, and witnesses were E. C. Maidment (Edwin Charles Maidment brother of Sophia), Elizabeth Gloag (uncertain of spelling and unclear as to her relationship to the couple), and Sarah Ann Maidment (nee Hogben and sister-in-law married to brother Edwin Charles Maidment). George and Sophia were married on the same day and place as her sister, Harriet Maidment married John William Wheeler. Sophia Ransom Maidment was born in Westbury, Wiltshire, England, on 3 October 1828, the daughter of Charles Maidment (1795-1865) and Esther Fanny Doel (1800-1866). She was christened on 22 May 1829 in the Old Independent Church, Westbury, Wiltshire. In these church records her name is registered as Sophia Rauson Maidment. She emigrated, with her parents and siblings aboard the "Charles Kerr" arriving in Adelaide , South Australia on 17 June 1840. According to the South Australian Archives, the Hodge Index - Application for Passage #6941 - 4 - 2 - 1840 Sophia is listed with father Charles Maidment aged 35, mother, and 2 male chn aged 5yrs/3wks and 4 females aged 13, 12, 8 and 2 yrs. Prior to arriving in Australia, Sophia lived with her family in Westbury, in Wiltshire England. At the time of her marriage in 1847, the Maidment family were living at Bugles Ranges, near Macclesfield. Bruce Marshall, a Maidment relative, has a copy of the Marriage Certificate of W. J. Maidment and Hannah Rogers who were married on 5 February, 1855 , also by the Rev. J. B. Austin. They were married at the private dwelling of Mr. Maidment Senr at Bugle Ranges near Macclesfield and the witnesses were George Ellis (brother-in-law), W.[William] Hogben (brother-in-law), Sarah A. Maidment (sister-in-law). William Joseph Maidment was Sophia's brother and Sarah Maidment (nee Hogben) was married to another of Sophia's brothers, Charles Edwin. William Hogben was married to Elizabeth Burnbridge Maidment, Sophia' sister. Together George and Sophia had the following named children: Ellen (1848-1923), William (1849-1916), Charles (1851-1926) my great grandfather, George (1853-1930), Benjamin (1855-1937), Edwin (1857-1925), Fanny (1859-1937), Frederick (1862-1927), Emily (1866-1937), Mary (1867-1945), and Louie (or Louey)(1869-1948). I understand there was another unnamed stillborn son born but do not know when or where he was born. I think Charles b1851 is not in picture - he married in 1872 and an early picture doesn' look like a match then doesn't seem a likely suspect. Charles was in Moonta 1874 then in Victoria 1876 onwards. George's occupation in a number of later records is recorded as a butcher, farmer, and storekeeper in Meadows. This photo from Hazel Alexander nee Ellis, granddaughter of Charles Ellis, was inscribed "Uncle Wm Ellis' Shop Meadows SA (Dad's Brother)" but I have not been able to confirm this with other Ellis family members. George and Sophia Ellis were later to reside in Malvern, Semaphore and later at Fasoda Street in Hyde Park in South Australia. The Adelaide Register on 9 June 1897 notes their Golden Wedding, the 50th anniversary of their marriage, was celebrated on the 7 June 1897 with a large family gathering at the residence of their son-in-law, Samuel Hamlyn. George Ellis died in Hyde Park, South Australia, on 17 July 1905; he was 83. His death certificate noted his cause of death to be that of senile decay. His passing was noted in the Advertiser on 18 July 1905. George was buried in Woodville, Cheltenham, South Australia, on 18 July 1905. According to the Enfield Record Office, this site is at the Cheltenham Cemetery Section C Path #13 Lot 31. It is my understanding the grave has since been "re-used". Sophia Ransom Ellis died in Hyde Park, South Australia, on 25 October 1906; she was 78. 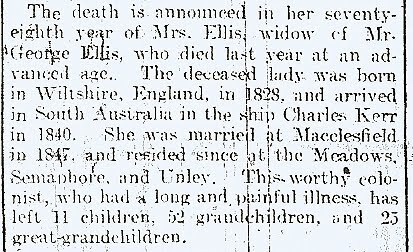 Her death was noted in the Advertiser on 26 October 1906. According to the Enfield Record Office she was also buried in Cheltenham Cemetery - Section C Path #13 Lot 31. It is my understanding this same grave has since been "re-used". Sophia's passing was also noted in the Adelaide Register. The Ellis children together with their spouses gathered in Adelaide at Christmas 1911. The families included the various Ellis families, Jury, Hamlyn, Finlayson, and Murray families. On 6 January 1912 the Adelaide Observer noted the “Family gathering of the complete family of George Ellis (dec) who arrived in South Australia in 1840”.